What people say... Our testimonials speak for themselves. Thank you for transforming our bungalow into a beautiful home with our new kitchen and bathroom. All the staff worked very hard and couldn’t do enough for us and were helpful in every way. With grateful thanks for your excellent service! It was a pleasure to deal with Newark Interiors and this adds to the pleasure of using our new appliances. As you know we have had two projects undertaken by your firm in recent months. First we had new fitted bedroom installed in June 2016 followed by the complete installation of a wet room in our elderly relatives ‘granny flat’ which was completed over over two weeks some three weeks later in July 2016. We would like to thank you for the high quality of workmanship and the attention to detail. We greatly appreciated the fact that any small problems/adjustments were completed by yourselves without further charge in the ensuing weeks. We would recommend you to anyone as a firm to be trusted to do a very good installation chance what it might be. Should we need any further upgrading of rooms in our home we will be in contact with you straight away. A big BIG thank you to all at Newark Interiors for our lovely new kitchen..all of our visitors have been thoroughly impressed with the style and finish..special thanks to Darryl who fitted the majority of it , to cabinet makers standards..to Mark who advised him and finished off the last few bits and pieces.. big Pete the plasterer.. Wodge the finicky sparky.. and Andy who delivered everything and cleared away all the rubbish… nothing was too much trouble from Jeff who helped us design it and Jim, the go to guy, who organised it all…they arranged for us to go to Manchester and choose our own granite and even when Silestone snapped a 3m length in fitting, they replaced it within a couple of days, over a weekend, the finish is perfect…at least have them give you a quote..they are no more expensive than any other bespoke kitchen company and you get a very top end finish and service…thanks again and sorry if I missed anyone out. Thank you so much for understanding how important it has been for me to create a new space in which to live, and for being so sensitive to my needs. The finished kitchen has surpassed all my expectations. I absolutely love it. You have been fantastic from start to finish. I wish to thank Newark Interiors for the excellent kitchen which has been fitted. We can not praise Darryl, Mark and Jamie too much. They work very hard, clean up swiftly and are the pleasure to have in the house. They are all very professional. Alan E. and Sharon H.
Many thank yous from us for doing a fantastic, professional job in our kitchen design. It feels like home and is so easy to use with the great design ideas. Thank you for yet another good job well done, in very short time, which in our current situation here was very much appreciated. Mick the plumber was very helpful & cooperative throughout. We would like to let you know have very pleased we have been with the refit of our kitchen. From the very first telephone conversation we had with yourself and subsequent calls and meetings with Jim and Laura, your efficiency and work has been excellent. Dates and timescales were always met and once the work was started you all carried on until it was finished. The staff who carried out the work were also excellent, particularly Marcin who has a very high standard that he likes to work to and is very particular and thorough in his work. Nothing was ever too much trouble and any ideas that we had you were able to follow through. All in all the whole project was a good experience and the outcome of our kitchen and utility is wonderful, we are really pleased with it all and thank you all very much. We would like to thank you for the smooth and efficient way the upgrade of our bathroom was carried out. Please convey our thanks to Laura and Jim and the tillers. We are delighted with the results. We just wanted to drop you a line to say a big thank you for our wonderful kitchen. The service that we received from Newark Interiors was second to none. The design, apart from looking absolutely stunning, is totally practical and easy to work with. The carousel, pull outs, pop ups and lighting all contribute to this. Please pass on our thanks to the rest of the team, they all worked so hard, were so helpful and did such a fantastic job. We feel that you created for us our ‘dream kitchen’. There is absolutely nothing that we would change! Thanks again. This is to thank you for your recent work on the refurbishing of our kitchen and to say that we are very pleased with the result. We particularly appreciate the helpful and friendly way in which the work was carried out and send our thanks to all concerned. Just wanted to congratulate you and your team on a job very well done. We are delighted with our new kitchen and still can’t believe it is finished and ready to enjoy. I liked the fact that for each job just one man turned up, bringing his own skill along with a very much appreciated sense of humour! The boys at the factory were extremely pleasant and helpful and nothing was too much trouble for them. I would vote ‘man of the match’ to be Marcin. We hope all our friends will see our kitchen and will be calling in to see you very soon. You have transformed the old, poorly designed, cramped kitchen that we inherited when moving into this property last November, into a large, airy, modern and highly functional kitchen which is a joy to live and work in and for which we are so grateful- thank you all. We are delighted with the kitchen- it looks fabulous! Please thank your staff for the quality of their work and the polite and professional way the carried out their work. They did and excellent job. I wish to thank all the staff at Newark Interiors for a superb job of my wonderful kitchen. Many Thanks. Just wanted to drop you a note to thank you for our kitchen. Please pass on our thanks to Marcin and Matt too- you all did a superb job and we haven’t stopped raving about Newark Interiors to all we know! We had a bit of a party at the weekend. The space worked brilliantly and needless to say everyone thought it was drop-dead gorgeous. Our decision to do the kitchen had great personal sentiment attached and it’s good to feel we’ve invested wisely with a truly stunning result. Thank you all once again. 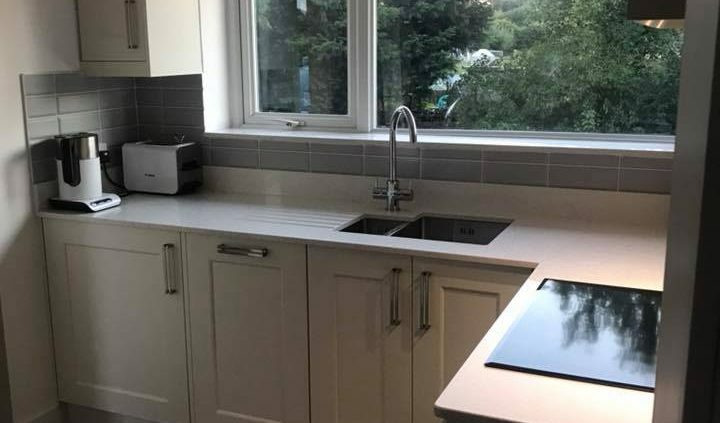 We would like to thank you and the Newark Interiors team for your work in designing and completing our kitchen, Throughout the process, from the initial consultation and design, through to the installation we have been impressed with the service and professionalism of all the team involved. Working with such friendly and amicable individuals certainly made the upheaval more bearable. We would not hesitate in recommending Newark Interiors to any of your potential customers.